At least two people were arrested and four intersections of major roads in the Nyanga area of Cape Flats were closed to traffic at the end of July following the latest violent protest over the lack of services and housing provided by the city. 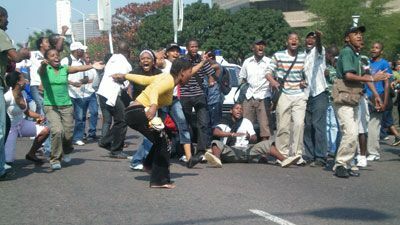 Police fired stun grenades and teargas at the protesters who blockaded the roads by burning tyres and setting fire to a passing bus. This is the most recent in a string of recent protests over services in disadvantaged districts of Cape Flats, with some of the protests involving residents closing roads by dumping toilet waste and household refuse. One of the oldest black townships in Cape Town, Nyanga is also one of the city's poorest and most dangerous districts, affected by high unemployment and HIV/AIDS.